My oldest "Great Mouse Detective" drawing in my collection. It's Basil and Olivia, from the scene at the toy store. (For those who don't remember, or have never seen it) Basil, Olivia & Dawson had just arrived at the toy store atop Toby's back. Basil was the first off of Toby and up to the window of the store. Olivia was next. Atop Toby's nose, she held out her hands, her arms outstretched, for Basil to catch her and bring her to safety. In an unhappy gesture, Basil holds out his arms, as to catch Olivia. In doing so, for a brief second, it looks as though Basil is embracing Olivia. It's an all-time favourite of mine. 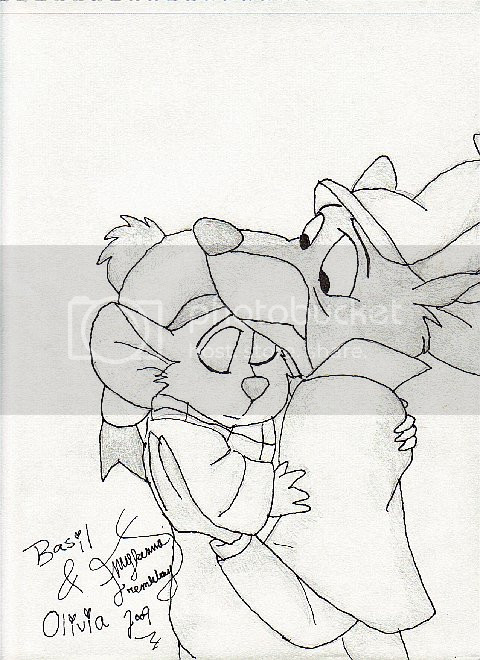 The Great Mouse Detective is the sole property of the Disney Studios, and although the drawing is mine, I do not own the characters.